I’ve always said that, if given the chance, I’d jump to hitch a ride on the space shuttle. To go into space!—how could I not? But while I certainly would want to peer out, to see what I couldn’t see from the ground, I’d bet that I’d probably spend even more time gazing on our small blue world. You know that old T-Bone Burnett tune, Humans from Earth? It’s actually a nasty little tune about otherworldly colonization, but that title has always stuck with me: this is where we started, as humans, and this is where we live, as humans. We might someday figure out how to be human outside of low Earth orbit, but everything about us, thus far, is grounded in experience living on this astonishing spinning ball of rock and water. 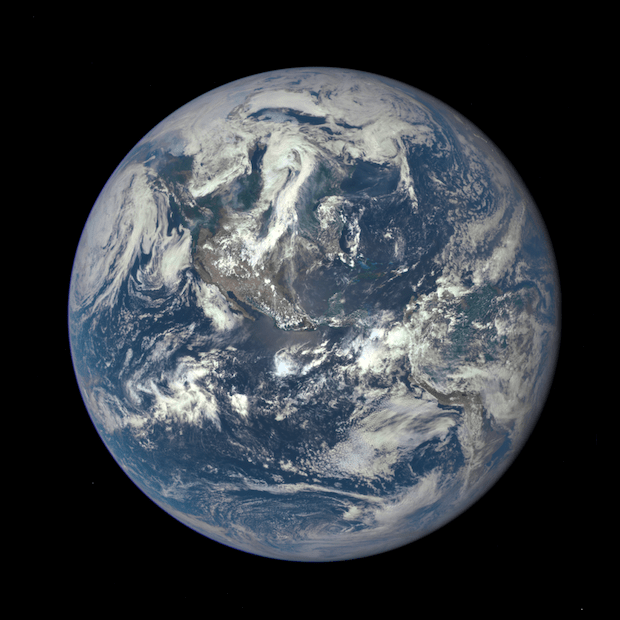 I didn’t always feel this way about Earth, tended to take it for granted. But at some point in my studies of genetics (and with a nudge from Ms. Arendt) I began to take seriously that we were worldly creatures, in the sense that we are shaped by our conditions, the most basic of which is that we are born, live, and die on this planet. There’s a scene from a Star Trek: The Next Generation episode “The Defector”, in which said defector, a Romulan, is taken to the holodeck in order to “visit” his home planet. At first he delights in the sights, but then he rejects the illusion: this was not home. Earth is home, to me. I understand, as someone who left her hometown and home state, that where one is from does not have to dictate where one goes; thus, I begrudge no one who might want to make a one-way trip to Mars, or beyond. One constant of humans from the very beginning of us is that some of stay, and some of us go. So, by all means, some of us should go. I’ll be waving from the ground. Osama bin Laden is dead; and. . . ? 1. I am opposed to the death penalty, in every case. Thus, as I noted in a comment at TNC’s joint, I may be parsing matters to consider bin Laden not the subject of a criminal trial, but a casualty of war. 2. I don’t like facile comparisons of bin Laden to Hitler or Al Qaeda to the Nazis; whatever the totalitarian similarities, the differences, I think, are are even greater. To want to cleanse the world of its inhabitants makes you an enemy of the world and its inhabitants and gives us license to treat you as such. I don’t celebrate his death—“grim satisfaction” seems the appropriate cliche—but I do think a kind of rough justice was done. 3. There are concerns that this action will give the US cover to leave Afghanistan sooner rather than later. Would that this would be so. 4. The death of bin Laden matters. I say this not as an expert on terrorism but more generally as a political scientists: Even if the death were only symbolic—his operational role was said to have diminished greatly in the past few years—the symbolism still matters. In both war and politics, symbolism matters. As to whether this will lead to a retrenchment or fracturing of Al Qaeda, well, either is a possibility. Bin Laden was apparently a charismatic figure, and his former number two (now presumptive leader) Ayman Al-Zawahri is not; that could matter in terms of holding together a far-flung criminal operation. Or not: The cell structure of Al Qaeda may mean that those freelancers gathered under the Al Qaeda banner have long since left the base of The Base behind. 5. Some are concerned at what happens next. As a general matter, I’m not concerned; something always happens next. Television-based analysts are already asking if the killing of Bin Laden will provoke revenge attacks by al Qaeda. Is there a stupider question in the world? The implication, of course, is that now, al Qaeda will truly be pissed off at the U.S. Unlike in 2001, when al Qaeda was only marginally angry at the U.S. He backs off that somewhat in later posts—yes, some terrorists may be moved to strike out in rage or grief—but as Al Qaeda was not much a political organization, that is, it was not an organization with which one could negotiate, any acts around it or in reference to it or against it would lead to a reaction. That there are reactions does not mean there should be no actions. 6. There are domestic political implications of all this, but it seems small, today, to consider them. 7. To circle back around to the Arendt quote: Yes, I think she got it right. [J]ust as you supported and carried out a policy of not wanting to share the earth with the Jewish people and the people of a number of other nations. . . we find that no one, that is, no member of the human race, can be expected to want to share the earth with you.